I remember last TV Season how excited I was for the premiere of Young Sheldon starring Iain Armitage. After all, I knew him as “Iain Loves Theatre.” What I didn’t know, is that I would also enjoy the talents of Wyatt McClure, who plays “Sheldon’s” friend “Billy,” portrayed by the hilarious Wyatt McClure. Wyatt is so funny on this show! I can’t wait to see how he makes me laugh in Season 2 of Young Sheldon which premiers September 24 on CBS at 8:30pm! Young Sheldon moves into its regular time slot of Thursdays at 8:30pm on CBS starting September 27! For more on Wyatt follow him on Facebook, Twitter, and Instagram! For more on Young Sheldon follow at https://www.cbs.com/shows/young-sheldon and on Facebook, Twitter, and Instagram! 1. You are so much fun to watch on Young Sheldon. Season 2 is getting ready to premiere on September 24. What can you tell us, if anything, about your character, "Billy Sparks" in this upcoming season? Well only a couple episodes filmed so far, but I can tell you I seem funnier and of course cuter! 2. Let's go back to the beginning for a moment. What made you want to audition for Young Sheldon initially? When the audition came through I was super excited because I am a HUGE fan of Big Bang Theory! 4. What do you relate to most about "Billy" and what is one characteristic of his that you are glad you yourself don't possess? I relate with “Billy” because I am super silly in real life and I am glad I don’t possess any farming abilities, like taking care of chickens. 5. Who or what inspired you to become an actor? I loved watching the cartoon The Backyardigans. I wanted to be a voice behind the characters or be able to make people laugh like they do. 6. What's the most fun thing about being a child actor and what is the most challenging? The most fun thing is meeting new people all the time at auditions or on on set. The most challenging is remembering all my lines and making sure I am prepared. 7. Of all the famous people out there that you have met, who were most excited about meeting so far? George Clooney! 8. Who do you hope to work with one day? Kevin Hart and the Rock ~ Would be a huge dream. 9. This Fall, audiences can see you in the new film Glass Jaw. What can you tell us about being part of this film? I play a mean bully. I really liked being on set and working with a stunt coordinator for the first time. I am NOT a bully though in real life. 10. For two seasons, you co-hosted the YouTube series Between 2 Phat Kids. In that show you also did interviews. As someone who has conducted interviews, what is one question I did not ask you that you wish I did (and please provide the answer to said question)? Q: Numerous roles have you cast as a bully - What do you want people to know about you? A: Because of my size, I do seem to be cast as a bully, but my personality always shows through. I am anything BUT a bully. I think that I am super funny, comical and have a soft heart. Wyatt McClure is an actor from Cleveland, OH. Wyatt has credits that include feature films Psychos, Terror of Hallow's Eve, and the unforgettable, Fault in Our Stars. This Fall, Wyatt will be see in the theatrical release, Glass Jar. 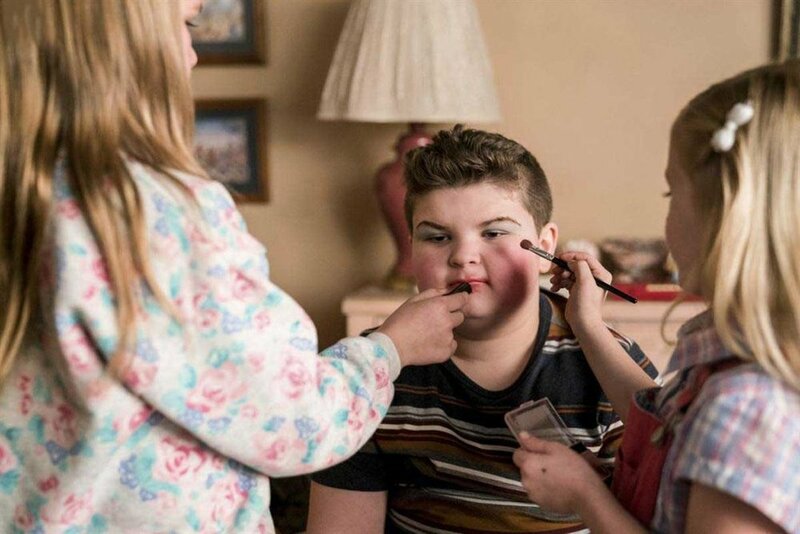 Prior to debuting on Young Sheldon, Wyatt showed off his comedy in the You Tube Series, Between 2 Phat Kids for two seasons. He and fellow Phat Kid, Brice Fisher, interviewed celebrities including Bill A. Jones from Glee, Josh Server from Good Girls Revolt, Alisa Reyes from All That, Ava Cantrell from Lights Out, Autumn Wendell from Every Witch Way, and more! They also performed in numerous skits, including fan favorite "Bye Felicia." He also has many hysterical moments on the series Reel Kids; his character "Mr. Smark" is one to remember! Wyatt is a huge sports fan and loves all teams Cleveland! He is obsessed with the Indians, The Cavs, and The Browns! He can tell you everything about his teams and others.